From the majority of reviews and my past experience I can say this driving school is the best! Don't be alarmed by any misguiding reviews! I took a 10 hr driving and 15hr theory from here and I had a great experience. Above All Safety Driving School is an awesome school to start off your driving with. They were very flexible with scheduling. Since they open 7 days. I had no problem arranging my timings with them. Amazing learning experience. I did not know how to drive at all going into the lessons but with the help of the instructors (especially Mr. Mirza) i was able to get my license on my first try! Above All Safety Driving School is operated from an OFFICE LOCATION UNLIKE many Driving Schools run from HOME. This makes it easier for customers to come into the office and also allows us to provide better customer service. 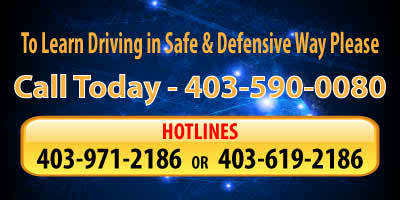 Above All Safety Driving School is local providing Calgary driving School that has been in business for over 10 years to new drivers and allowing them to confidently and safely drive. We specialize in providing driving classes for students who are trying to attain a license and ensure that they are ready to take the Driving Test. We are a family run business that cares about the service we provide to our customers and strive to produce successful students! Our Calgary Driving school is located at 115-55 Westwinds Crescent N.E, Calgary, in an optimal location by the Mcknight Train station that allows for easy access to the school. Our driving courses all include a FREE pickup and drop off for all of your classes to save yourself the hassle! Driving Classes operate after business hours which allows for classes to run from 7am-9pm and open all days of the week; this allows for us to have flexible schedules which fit the students needs. A major difference between us and many other driving schools is our experience, office location, and many services provided. We have experience of over 10 years being open. Another thing that sets us apart from competitors is that we are run from an OFFICE location unlike many homerun driving schools which cannot match the customer service that comes from having an office which students come walk into! We provide many services such as Defensive Driving Course (DDC), In Class Theory, Brush-up, Insurance Reduction Course, and Car Rental for road tests. Our Theory and Defensive Driving classes are done in a classroom located in our driving school. WHY CHOOSE OUR DRIVING COURSES? We have many professional instructors and operate driving classes for 7 days a week from 7am-9pm. Pick up and drop off is free all around Calgary, Airdrie, Chestermere. We make sure to book your road test for you so that you don’t have to! Customer service is always available even outside business hours because we transfer our calls to a receptionist that is available early and late in the day. WHO ARE OUR DRIVING INSTRUCTORS? We have many instructors which are FEMALE and MALE and you can choose whichever instructor you find best. Instructors can talk in a variety of languages that are demanded by new drivers coming from different countries such as English, Punjabi, Hindi, and Urdu. Many of our instructors are have a vast background of experience including driving semi-trucks, trailers, transit bus, and taxi. This experience allows for instructors to have the proper knowledge to be good teachers for students that are learning how to drive. All of our instructors are all fully qualified by Alberta Road Safety to teach students to drive. WHAT DRIVING COURSES DO YOU NEED? New Drivers: Most new drivers are recommended to do the Insurance Reduction Course which gives you 10 Hrs Driving and 15 Hrs Classroom Theory. The 10 hours of driving are usually done in 5 parts of 2 hours each to allow for maximal retention of driving skills; we pick you up and drop you off for free for all 10 hours of driving. The 15 hours of theory are done in 2 separate parts of 7.5 hrs in the classroom located at our school. After passing this course you will be given an INSURANCE REDUCTION CERTIFICATE which can save you up to 40% off insurance costs every year! This means that you will save more every year then the cost of the course itself. After completing your 10 hours of driving if you are ready for the road test we will book it for you whenever it fits in your schedule. Experienced Drivers: If you have already been driving and need to refresh your skills and learn the rules of the road to prepare you for the road test we recommend our 2 hour brush up course. In this 2 hour brush up course we will prepare you for what you need to know for the road test. Get back 3 DEMERITS: If you need to do the DDC (Defensive Driving Course) because you have too many demerits we provide this service. It is done in the classroom at our school and upon passing we will provide you a DDC certificate that will give you 3 Demerits off your driving record, getting back these demerits can possibly save you from license suspension!
" Turn on your headlights whenever you drive, and especially in rain, fog, sleet, freezing rain, or snow. In fog, heavy rain or snow, do not use your high beam headlights as it only makes it harder to see."